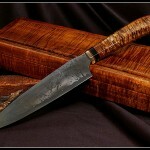 Salter Fine Cutlery: Artistry with an Edge! 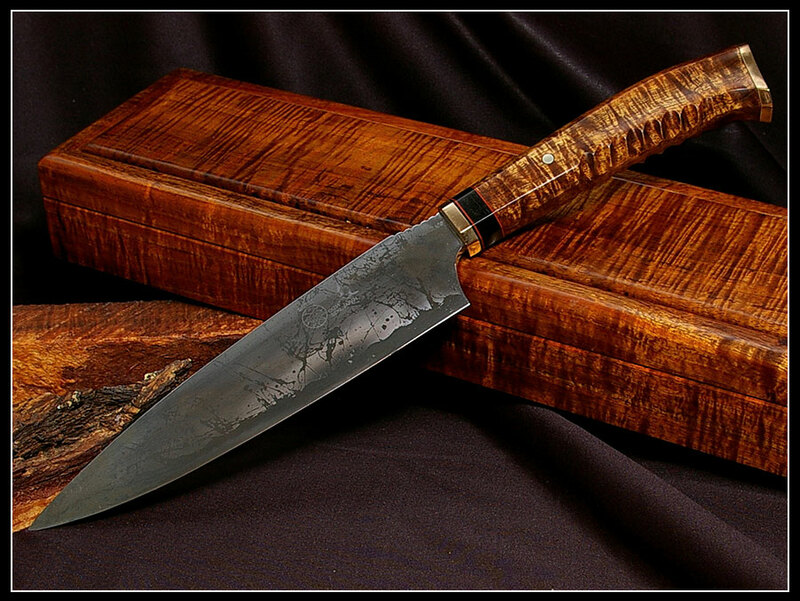 When master craftsman Gregg Salter of Salter Fine Cutlery creates one of his exquisite custom knives, he infuses a lifelong passion for unique knives with the time-honed perfection of a true artist. 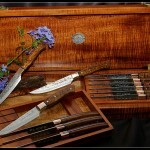 Specializing in steak knives, professional grade chef knives, heirloom quality hunting and pocket knives, and elegant presentation boxes, each piece is custom designed and crafted using the same hand processes and finishing techniques perfected by Old World masters. 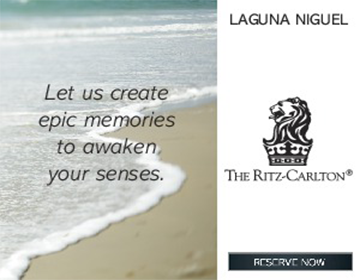 And, each receives the same degree of care and attention not seen in widely manufactured or machine-tooled brands. 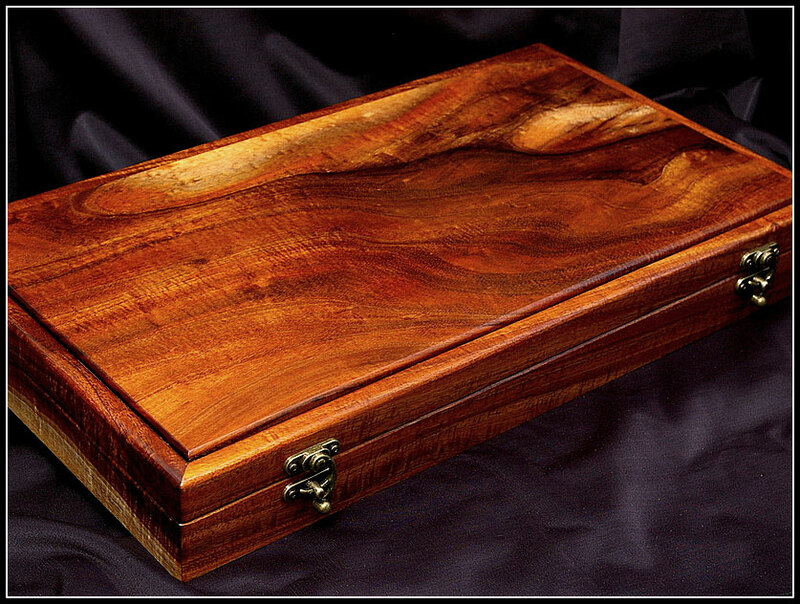 Located on the Big Island of Hawaii, Salter Fine Cutlery’s knives and boxes are made from the island’s distinctive and highly sought after, premium curly koa wood—a wood that is so rare it can only be harvested from natural fall using a specific process that promotes regrowth of Hawaii’s precious, indigenous trees. Every piece of sustainably harvested koa is hand-shaped, -polished, and -crafted from wood that’s been carefully chosen for its unique coloration and grain patterns to create individual knives and complete sets that allow the natural beauty and chatoyance of this stunning wood to shine through. 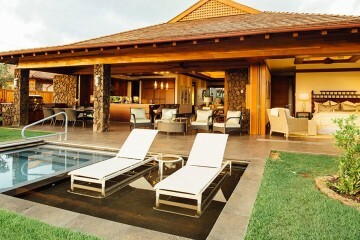 While Hawaiian koa is their signature wood, Salter Fine Cutlery also offers a wide selection of exotic woods to create a look that is truly unique and suits any aesthetic preference. 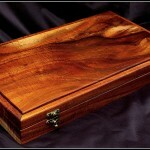 They can procure all legally attainable woods, including beautiful specimens such as kiawe, mango, wenge, Gabon ebony, African blackwood, Hawaiian milo, and mahogany. But cutlery needs to be more than a beautiful piece of art for the kitchen or table—it needs to be a precision instrument for preparing and enjoying fine cuisine. This is why all Salter Fine Cutlery blades are hand-forged by Japanese master bladesmiths. 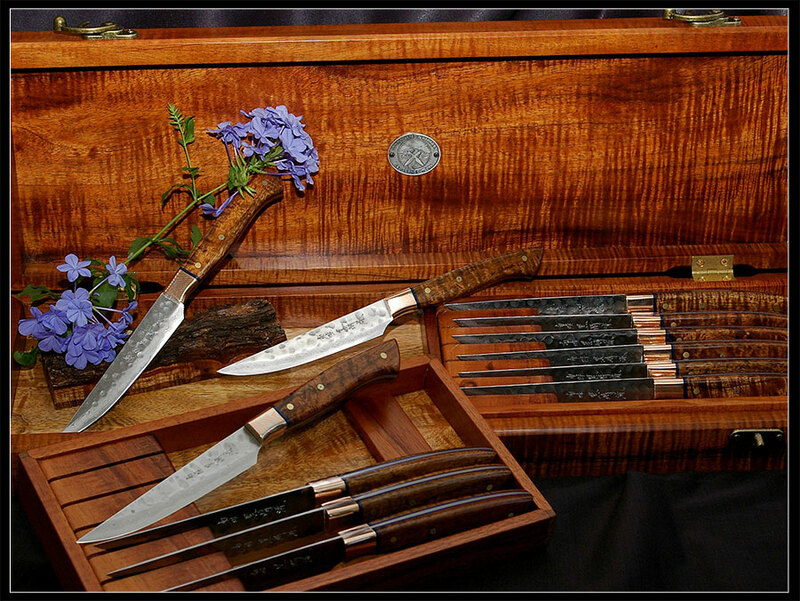 Having traveled to Japan and visited extensively with masters trained in traditional forging methods, Salter has developed relationships with renown bladesmiths who make each blade to order using the highest quality steel and finishing techniques, and who can accommodate the artistic designs for Salter Fine Cutlery’s truly unique, one-of-a-kind and limited edition collector’s knives. 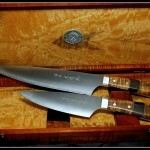 Currently, two such collectibles are available: the 2015 Combat Chef and the Horsa Seax. Both of these exclusive items boast blades of OU-31 steel with distinctive hand-etching, crafted and ground by the world famous Kiku Matsuda. The original Combat Chef; each of our 2015 Combat Chef collectibles will feature similar blades with completely unique handles. The 2015 Combat Chef’s blade is further set apart in artistry and design with a remarkable, mirror polish finish. This hidden tang, individually free-formed blade has been custom designed exclusively for Salter Fine Cutlery. 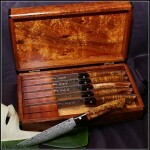 In addition to being able to design a handle and presentation box to the buyer’s specification—grip size, design, choice of ebony, African blackwood, or horn decorative inserts under the bolster, and choice of color for the decorative spacers—this special order collector’s knife and accompanying presentation box will be offered with wood from Salter Fine Cutlery’s special reserve collection of extremely rare, old-growth premium curly koa. 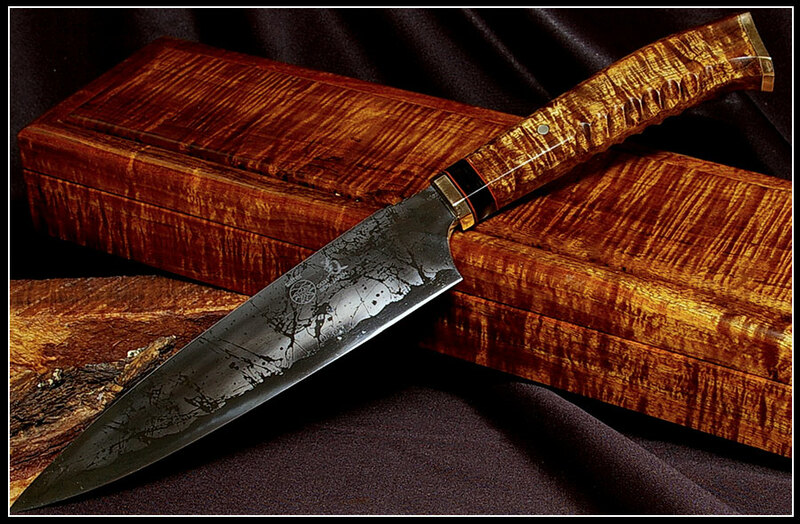 Finished with a hand-forged mokume bolster and a specially made end cap that fuses brass, nickel-silver, and copper into one sheet that is then hand-twisted and hammered to a fine Damascus, the 2015 Combat Chef is a must-have for serious collectors. Since each 2015 Combat Chef will be individually designed and crafted to taste, advance ordering is required. Salter’s passion for creating one-of-a-kind collectibles with a flair for historical reference can be seen in his latest creation, the Horsa Seax. Named after the famous Anglo-Saxon warrior, this collectible is a nod to both Salter’s native homeland of England and blademith Kiku’s famous tactical knives. 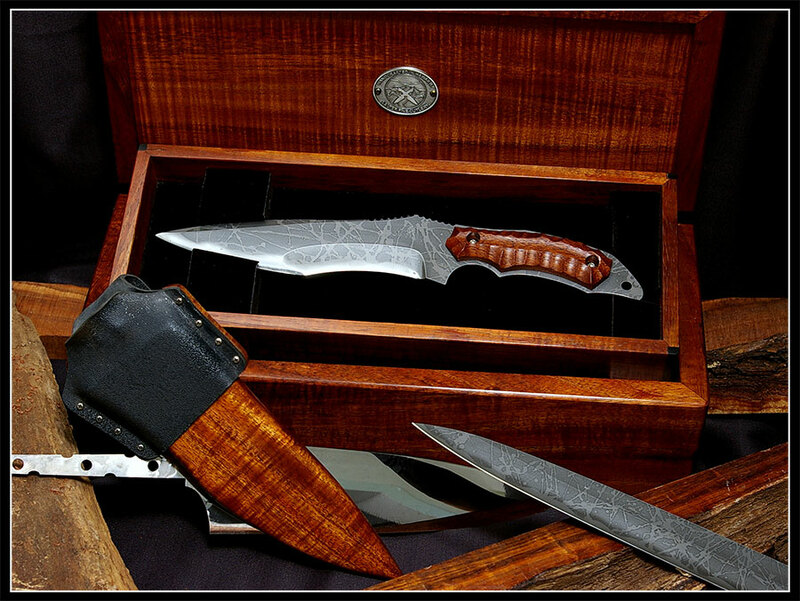 The Horsa Seax is a true blend of artistry and functionality, although many collectors may prefer to keep it safely stored in its custom-fitted, two-tiered, velvet-lined, koa presentation box. The tactical handle is made with Hawaiian kiawe wood, and the handcrafted sheath blends Hawaiian koa with nearly indestructible Kydex. 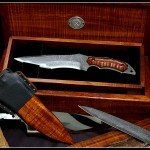 The Horsa Seax is available for immediate purchase. As with their collectibles, blades for Salter Fine Cutlery’s everyday lines are hand-forged by Japanese bladesmiths. Most blade styles are available in a variety of steel grades and finishes, making exquisite knives customizable for personal use or as stand-out, memorable gifts. Popular steels include YSS Shirogami (white paper), YSS Aogami (blue paper), Aogami Super Clad, R2 clad or mirror-etched, VG-10 Stainless, VG-10 with a Shirogami steel core, and SGII Stainless. Every cutlery product offered is available with a matching keepsake box, presentation box, or kitchen stand for safe and beautiful storage and display. 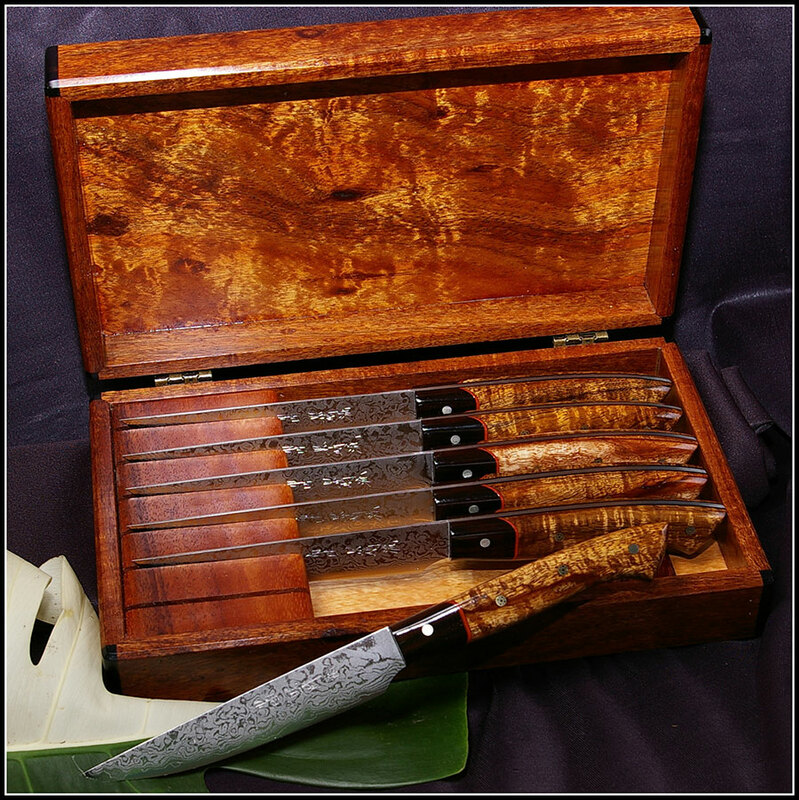 In addition to table and kitchen knives, Salter Fine Cutlery’s handcrafted koa hunting and pocket knives are excellent heirloom gift options for him, while their custom-designed koa jewelry boxes make elegant gifts for her. The results are worth the wait. 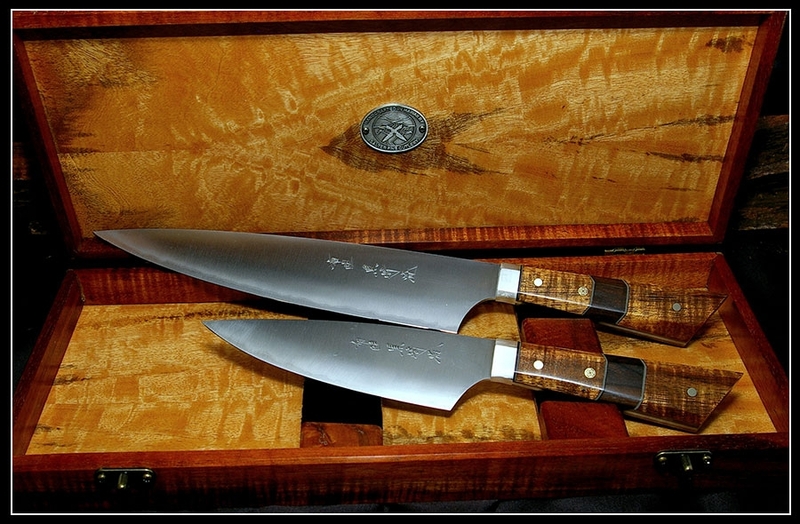 If you’d like to see these gorgeous knives on your holiday table, advance ordering is highly recommended. 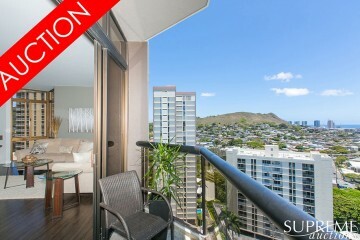 For direct contact, email [email protected] or call 808.883.0128.